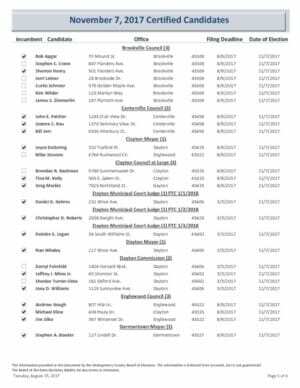 From the Montgomery County Board of (S)Elections today, the complete candidate list. For Dayton Public Schools there are 8 candidates for 4 seats, and seeing as one is an incumbent. Which is an odd coincidence- if the current board, with the vote of no confidence in them and the Superintendent did the right thing- there would be 7 seats available. There is another issue, with my filing of candidacy for the Montgomery County Educational Service Center board. Despite it being mandated that DPS purchase services from the MCESC, and that they are the first people the State turns to in a state takeover, somehow, despite it being THE MONTGOMERY COUNTY ESC- I’m not eligible to sit on the board, although people in Brookville and Trotwood are (which both have city school districts). There are some other questions about the legitimacy of the oversight of this organization- including how much involvement it has with the Issue 9 money and Learn to Earn. I am consulting with State legislators and my volunteer legal team to challenge this strange taxation without representation. The same three people have run un-opposed before- and we know what happens there. In other DPS news- the board will vote to accept the new contract with the DEA tonight- several months later than it should have been settled. Superintendent Rhonda Corr claims she settled it single handily after her negotiations team failed (her words). What’s missing from this picture? The reality that there are 10 other bargaining units- and none of their contracts have been settled. The real question that the board should answer today- is if they still have faith in the Superintendent and her capacity to lead the district. Regarding the MCESC Board, where do the current (and past) members live? Any obvious contradictions to what you have been told? BTW, since they seemed to be lying in wait did you get your $30 filing fee back? I will be filing in court for a review of eligibility. The BOE has yet to deliver a requested map of where these mysterious eligible voters are to run for the MCESC- since the incumbents live in Brookville and Trotwood- which both have municipal schools.